Från de första stapplande stegen tills skrift och civilisationer tog över, vilket är olika länge i olika delar av världen. 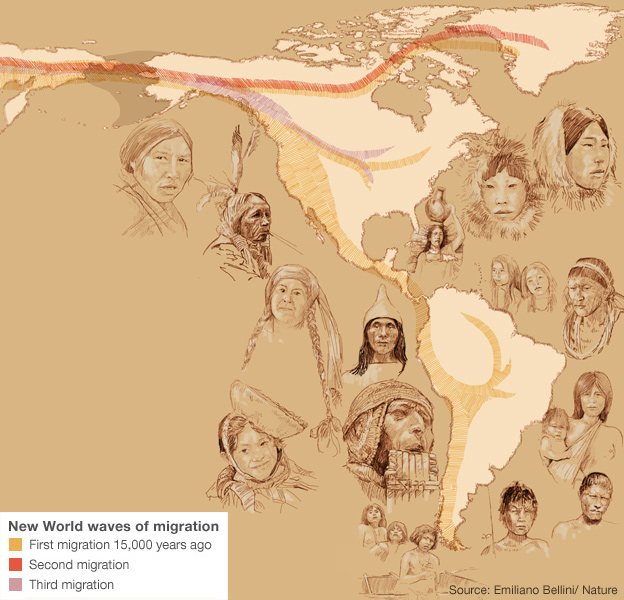 The biggest survey of Native American DNA has concluded that the New World was settled in three major waves. But the majority of today's indigenous Americans descend from a single group of migrants that crossed from Asia to Alaska 15,000 years ago or more. Previous genetic data have lent support to the idea that America was colonised by a single migrant wave. An international team of researchers have published their findings in the journal Nature. "For years it has been contentious whether the settlement of the Americas occurred by means of a single or multiple migrations from Siberia," said co-author Prof Andres Ruiz-Linares from University College London (UCL). "But our research settles this debate: Native Americans do not stem from a single migration. Our study also begins to cast light on patterns of human dispersal within the Americas." The team analysed data from 52 Native American and 17 Siberian groups, studying more than 300,000 variations in their DNA known as Single Nucleotide Polymorphisms, or SNPs. Tyvärr är min engelska inte så bra att jag förstår allt vad som står. Det som jag finner mest intressant är att indianernas förfäder nådde Sydamerika redan i första vågen. En annan källa har nyligen kommit fram med att stenålders-européer också har nått kontinenten, långt innan. En spännande tanke. New archaeological evidence suggests that America was first discovered by Stone Age people from Europe – 10,000 years before the Siberian-originating ancestors of the American Indians set foot in the New World. A remarkable series of several dozen European-style stone tools, dating back between 19,000 and 26,000 years, have been discovered at six locations along the US east coast. Three of the sites are on the Delmarva Peninsular in Maryland, discovered by archaeologist Dr Darrin Lowery of the University of Delaware. One is in Pennsylvania and another in Virginia. A sixth was discovered by scallop-dredging fishermen on the seabed 60 miles from the Virginian coast on what, in prehistoric times, would have been dry land. The new discoveries are among the most important archaeological breakthroughs for several decades - and are set to add substantially to our understanding of humanity's spread around the globe. The similarity between other later east coast US and European Stone Age stone tool technologies has been noted before. But all the US European-style tools, unearthed before the discovery or dating of the recently found or dated US east coast sites, were from around 15,000 years ago - long after Stone Age Europeans (the Solutrean cultures of France and Iberia) had ceased making such artefacts. Most archaeologists had therefore rejected any possibility of a connection. But the newly-discovered and recently-dated early Maryland and other US east coast Stone Age tools are from between 26,000 and 19,000 years ago - and are therefore contemporary with the virtually identical western European material. What’s more, chemical analysis carried out last year on a European-style stone knife found in Virginia back in 1971 revealed that it was made of French-originating flint. Professor Dennis Stanford, of the Smithsonian Institution in Washington DC, and Professor Bruce Bradley of the University of Exeter, the two leading archaeologists who have analysed all the evidence, are proposing that Stone Age people from Western Europe migrated to North America at the height of the Ice Age by travelling (over the ice surface and/or by boat) along the edge of the frozen northern part of the Atlantic. They are presenting their detailed evidence in a new book - Across Atlantic Ice – published this month. At the peak of the Ice Age, around three million square miles of the North Atlantic was covered in thick ice for all or part of the year. However, the seasonally shifting zone where the ice ended and the open ocean began would have been extremely rich in food resources – migrating seals, sea birds, fish and the now-extinct northern hemisphere penguin-like species, the great auk. Stanford and Bradley have long argued that Stone Age humans were quite capable of making the 1500 mile journey across the Atlantic ice - but till now there was comparatively little evidence to support their thinking. But the new Maryland, Virginia and other US east coast material, and the chemical tests on the Virginian flint knife, have begun to transform the situation. Now archaeologists are starting to investigate half a dozen new sites in Tennessee, Maryland and even Texas – and these locations are expected to produce more evidence. Another key argument for Stanford and Bradley’s proposal is the complete absence of any human activity in north-east Siberia and Alaska prior to around 15,500 years ago. If the Maryland and other east coast people of 26,000 to 19,000 years ago had come from Asia, not Europe, early material, dating from before 19,000 years ago, should have turned up in those two northern areas, but none have been found. Although Solutrean Europeans may well have been the first Americans, they had a major disadvantage compared to the Asian-originating Indians who entered the New World via the Bering Straits or along the Aleutian Islands chain after 15,500 years ago. Whereas the Solutreans had only had a 4500 year long ‘Ice Age’ window to carry out their migratory activity, the Asian-originating Indians had some 15,000 years to do it. What’s more, the latter two-thirds of that 15 millennia long period was climatologically much more favourable and substantially larger numbers of Asians were therefore able to migrate. As a result of these factors the Solutrean (European originating) Native Americans were either partly absorbed by the newcomers or were substantially obliterated by them either physically or through competition for resources. Some genetic markers for Stone Age western Europeans simply don’t exist in north- east Asia – but they do in tiny quantities among some north American Indian groups. Scientific tests on ancient DNA extracted from 8000 year old skeletons from Florida have revealed a high level of a key probable European-originating genetic marker. There are also a tiny number of isolated Native American groups whose languages appear not to be related in any way to Asian-originating American Indian peoples. But the greatest amount of evidence is likely to come from under the ocean – for most of the areas where the Solutreans would have stepped off the Ice onto dry land are now up to 100 miles out to sea. The one underwater site that has been identified - thanks to the scallop dredgers – is set to be examined in greater detail this summer – either by extreme-depth divers or by remotely operated mini submarines equipped with cameras and grab arms. Det gick nått program på tv om människans migration (BBC?) för tja kanske ett år sedan. Det var väldigt intressant, och när det gällde Amerikas så tror jag de nämnde iallafall två vågor. Men en sak fångade mitt intresse och det var att man i Brasilien i djupa jordlager funnit ett skelett av en kvinna med negroida drag. Men utvecklade inte det hela mer men jag tänkte att varför kunde inte människor också kommit i den vågen som kolonieserade Australien b.l.a också kommit över till Syd-amerika. Inte för att det ger diskussionen något kanske men somliga, ganska få kanske, indianer/first nations accepterar inte Bering Bridge teorin. Det går inte ihop med deras religion, folk har funnits i Amerika sedan begynnelsen, och även berättelser inom nationen talar för annat. Deras berättelser jämfört med europeers kan jag tänka mig kan vara ganska sanna då allting inom spiritualismen för det mesta ärvs från generation till generation och ingenting finns skrivet i evangeler. Nåja, värt att nämnas i tråden tycker jag då man kan förolämpa folk i amerika utan att man vet varför. Schwemppa skrev: En annan källa har nyligen kommit fram med att stenålders-européer också har nått kontinenten, långt innan. En spännande tanke. New archaeological evidence suggests that America was first discovered by Stone Age people from Europe – 10,000 years before the Siberian-originating ancestors of the American Indians set foot in the New World. A remarkable series of several dozen European-style stone tools, dating back between 19,000 and 26,000 years, have been discovered at six locations along the US east coast. Chemical analysis carried out last year on a European-style stone knife found in Virginia back in 1971 revealed that it was made of French-originating flint. Professor Dennis Stanford, of the Smithsonian Institution in Washington DC, and Professor Bruce Bradley of the University of Exeter, the two leading archaeologists who have analysed all the evidence, are proposing that Stone Age people from Western Europe migrated to North America at the height of the Ice Age by travelling (over the ice surface and/or by boat) along the edge of the frozen northern part of the Atlantic. Some genetic markers for Stone Age western Europeans simply don’t exist in north-east Asia – but they do in tiny quantities among some north American Indian groups. Solutrean-hypotesen siger, at stenaldermennesker er vandret fra Europa til Amerika for ca 20.000 år siden - og at de jo kun havde isen, der dækkede Nordatlanten, at vandre på. Der foreslås tilsyneladende ikke, at stenaldermennesker ufrivilligt er transporteret over Atlanten på et gigantisk isbjerg – "større end Sjælland og Gotland" – og at de efter en lang rejse fra Frankrig/Spanien og sydpå omkring ækvator er ankommet til Amerika. Hypotesen afvises fra flere sider, af både arkæologer og dna-folk. Johan Matsson skrev: Deras berättelser jämfört med europeers kan jag tänka mig kan vara ganska sanna då allting inom spiritualismen för det mesta ärvs från generation till generation och ingenting finns skrivet i evangeler. Nåja, värt att nämnas i tråden tycker jag då man kan förolämpa folk i amerika utan att man vet varför. Comancherna kunde på 1700-talet inte komma ihåg hur de fick hästar. Kiowas förklarade sitt ringa antal med en myt om att stammen fötts ur en trädstam och en squaw var för fet och stoppade processen. En grupp av Kiowas var Apacher men hade helt glömt bort det. Upptäcktes när de började umgås mera fredligt med andra apacher i reservat. Indianska myter om landskapet brukar vara underhållande och så vederhäftiga. Men det är en mycket intressant att det fanns människor på östkusten före Clovis-kulturen. Jag har uppfattat att de som kom Beringvägen var en kustkultur. Hur kunde de så snabbt komma till östkusten ? Skulle man hitta mitokondrier från dem misstänker jag att de inte är släkt med någon indian idag. För att komplicera saken ytterligare så har vi ju också "Kennewick-mannen", ett skelettfynd från delstaten Washington (i nordväst alltså) som bedömts vara mellan 5 650 och 9 510 år gammalt - och som är klart avvikande från alla tidigare skelettfynd i Amerika. Flera forskare anser att dess närmaste släktskap är med ainu-folket i norra Japan, eller möjligen med polynesierna. gnikam4 skrev: För att komplicera saken ytterligare så har vi ju också "Kennewick-mannen", ett skelettfynd från delstaten Washington (i nordväst alltså) som bedömts vara mellan 5 650 och 9 510 år gammalt - och som är klart avvikande från alla tidigare skelettfynd i Amerika. Flera forskare anser att dess närmaste släktskap är med ainu-folket i norra Japan, eller möjligen med polynesierna. Ja fast jag menade att de redan hade skäggväxt när de vita först dök up. Själva påståendet att invandringen skedde i tre huvudsakliga vågor har väl varit känd/accepterad rätt länge. Har åtminstone jag trott. Men det är väl för all del bra att få det bekräftat med gener. Som sondering påpekar. Hade natives skägg redan då europeerna kom dit. Inom både Paracas, Nasca, Moche och Huari kulturen har man både hittat mumier med skägg samt keramik statyer med människor med skägg. ibland avbildade som slavar, ibland som adel/kungar. Mumierna har rött skägg och hår men det kanske beror på föruttnelseprocessen mer än ursprunglig färg. Knaske nån som vet? Paracaskulturen var om jag inte minns fel ca2000 f.Kr. Nu har man sekvenserat genomet hos en individ tillförande Clovis-kulturen. Clovis, with its distinctive biface, blade and osseous technologies, is the oldest widespread archaeological complex defined in North America, dating from 11,100 to 10,700 14C years before present (bp) (13,000 to 12,600 calendar years bp)1, 2. Nearly 50 years of archaeological research point to the Clovis complex as having developed south of the North American ice sheets from an ancestral technology3. However, both the origins and the genetic legacy of the people who manufactured Clovis tools remain under debate. It is generally believed that these people ultimately derived from Asia and were directly related to contemporary Native Americans2. An alternative, Solutrean, hypothesis posits that the Clovis predecessors emigrated from southwestern Europe during the Last Glacial Maximum4. Here we report the genome sequence of a male infant (Anzick-1) recovered from the Anzick burial site in western Montana. The human bones date to 10,705 ± 35 14C years bp (approximately 12,707–12,556 calendar years bp) and were directly associated with Clovis tools. We sequenced the genome to an average depth of 14.4× and show that the gene flow from the Siberian Upper Palaeolithic Mal’ta population5 into Native American ancestors is also shared by the Anzick-1 individual and thus happened before 12,600 years bp. We also show that the Anzick-1 individual is more closely related to all indigenous American populations than to any other group. Our data are compatible with the hypothesis that Anzick-1 belonged to a population directly ancestral to many contemporary Native Americans. Finally, we find evidence of a deep divergence in Native American populations that predates the Anzick-1 individual.